The Cambium Wellness Center describes very beautifully how these devices work. Two stainless steel plates ionize water creating hydroxides which have a negative charge. Heavy metals, herbicide and pesticide residues, toxins, chemicals, drugs and pharmaceuticals get stuck in the body with a positive charge. These positive charges get neutralized during an ionizing body detox session promoting elimination in the urine, feces and sweat for the next two or three days. 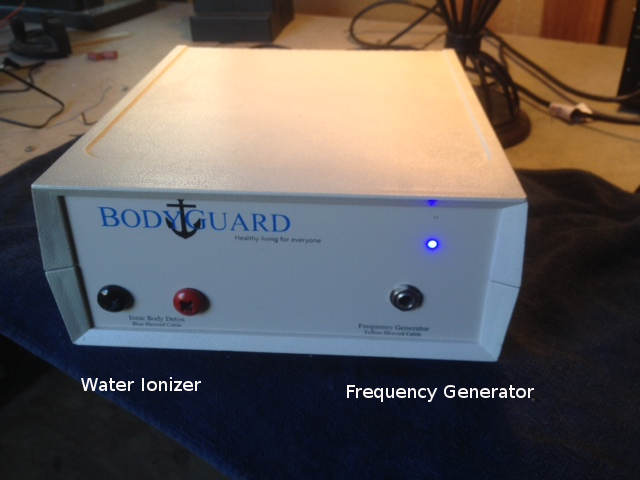 The BodyGuard generates only negative ions in the water for detoxification. Society gets more than enough positive ions by way of pesticides, food additives, electromagnetic fields, mobile phones, cell towers, power lines, computers, air conditioning and so many more sources. An internet search provides an intense amount of information regarding the harmful effects of positive ions. The zapper changes the terrain of the body and parasites move out. The zapper is gentle enough to use in your mouth and other parts of the body to rid your body of fungus, bad bacteria, viruses and other pathogens. For more information on the BodyGuard, use this link. You will find information on training, warranty, purchasing, leasing, testimonials, more videos, word document downloads, audio conference calls and many other resources. Here is a link to another product we manufacture. It is the BodyGuard in a black enclosure with a different name. This product is not a medical device. It is an experimental cleansing device. to diagnose, treat, cure or prevent disease.